Download the Fedora Minimal ARM server image and save it in your home dir. 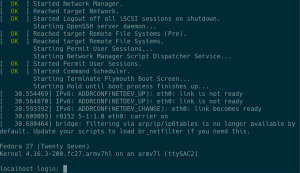 Install the Fedora ARM installer and U-Boot bootloader files for the device on your host PC. Insert your SD card into your computer and note the device (mine is /dev/mmcblk0) using dmesg or df commands. Once you know that, open a terminal and let’s write the Fedora image to the SD card! Note that we are using none as the target because it’s not a supported board and we will configure the bootloader manually. First things first, we need to enable the serial console, turn off cpuidle else it won’t boot, and fix a bug where USB doesn’t load in the right order. We do this by mounting the boot partition on the SD card and modifying the extlinux bootloader configuration. As mentioned, the kernel that comes with Fedora 27 image doesn’t support the Ethernet adapter, so if you don’t have a spare USB Ethernet dongle, let’s download the updates now. If you’re using Fedora 28 this is not necessary. Now continue with the process, unmount the boot partition. Now, we can embed U-Boot and the required bootloaders into the SD card. To do this we need to download the files from Hardkernel along with their script which writes the blobs (note that we are downloading the files for the XU4, not HC1, as they are compatible). We will tell the script to use the U-Boot image we installed earlier, this way we are using Fedora’s U-Boot not the one from Hardkernel. Download the required files from Hardkernel. Copy the Fedora U-Boot files into the local dir. Finally, run the fusing script to embed the files onto the SD card, passing in the device for your SD card. That’s it! 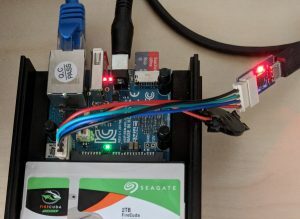 Remove your SD card and insert it into your ODROID, then plug the UART adapter into a USB port on your computer and connect to it with screen (check dmesg for the port number, generally ttyUSB0). Now power on your ODROID. If all goes well you should see the SOC initialise, load Fedora’s U-Boot and boot Fedora to the welcome setup screen. Complete this and then log in as root or your user you have just set up. 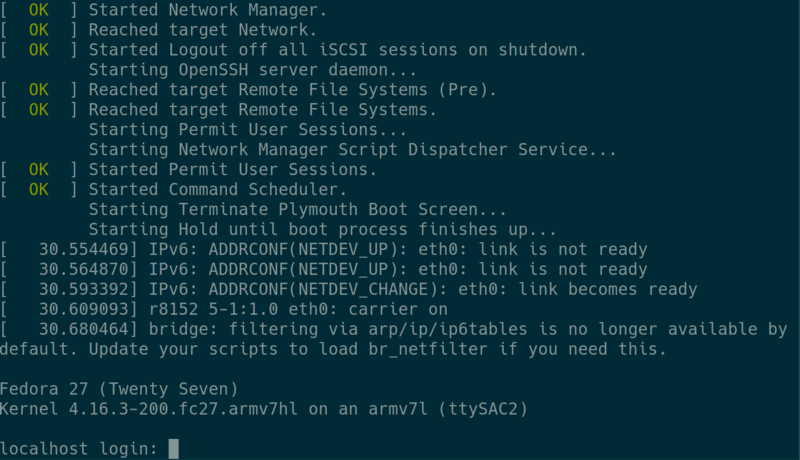 Welcome configuration screen for Fedora ARM. If you’re running Fedora 27 image, install the kernel updates, remove the RPMs and reboot the device (skip this if you’re running Fedora 28). Fedora login over serial connection. You can find your SATA drive at /dev/sda where you should be able to partition, format, mount it, share it and well, do whatever you want with the box. You may wish to take note of the IP address and/or configure static networking so that you can SSH in once you unplug the UART. I also have a HC1 and use Fedora Server. I started with a setup similar to what you describe but then went ahead and moved the Fedora system over to the SSD. This works fine, but now I wonder if it is also possible to move /boot partition over to the SSD. Do you have any experience with this? I also noticed that grubby (?) is generating incorrect extlinux.conf entries when updated kernels are installed, for example I see “Ignoring unknown command: default=Fedora” on boot because there should be no equals sign behind default. I guess this is actually a Fedora bug? Hey Michael, I see those errors too, I just assume it wasn’t compatible with the version of U-Boot or something.. might look into that more later. As for /boot partition being on the SSD I’m not sure that will work as the SOC only boots off the SD or EMMC. The SSD is connected to a JMicron USB-SATA controller which has no U-Boot support, AFAIK. You could netboot it instead, probably, and skip the SD card, but then you’re reliant on the network. I think /boot on the SD card is probably as good as you’ll be able to get, unfortunately. Can I ask you a question now? I am having problems with stock Fedora 27 and 28 kernels not always detecting the SSD. Doesn’t seem to be related to cold, warm or hot boots. When it doesn’t work I get “bad usb cable” errors from the kernel. I compiled upstream 4.16 kernel and it works flawlessly every time. Have you noticed anything similar? Thanks! Does somebody know why only 4 cores will be used by fedora? Are there settings to activate all 8 cores? The tutorial is great, and thank you for writing it! I was eventually able to fix this with running `sudo cp /mnt/exynos5422-odroidhc1.dtb /mnt/exynos5422-odroidunknown.dtb` while /dev/mmcblk0p2 was still mounted to /mnt. It is easy to boot with rootfs on your sata drive. I did this with F29. Build your uSD card as above, but delete the rootfs partition, rather than grow it. Just run the installer script onto your sata drive (attached to your computer with a usb/sata adapter). Delete the boot partition and grow the rootfs partition (I am lazy and use gparted). Do not bother installing the bootloader or uboot on the sata drive. Insert the uSD card and sata drive and boot. This works because both media are created with dd so the uuids are the same. I am working on also running boot from the sata like I do on my Cubieboards (and some other Allwinner SOC), but so far I cannot get it to work. If anyone else has run with all partitions on the sata drive, please share what you did. How do I turn off the flashing blue LED? That blue light is really annoying. Perhaps a solid blue might be OK, but flashing is too distraction. The Hardkernel bootloader and current uboot seem to be bigger than the 2048KB allot in the Fedora image. Delete the Raspberry Pi fw partition (partition #1) FIRST before installing the bootloader, or you may not be able to get it mounted on your workstation again. I have had problems with this. Just finished installing F29 on a HC2 everything worked as described here in the post with the addition of creating the exynos5422-odroidunknown.dtb file as mentioned by Derek. Many thanks!